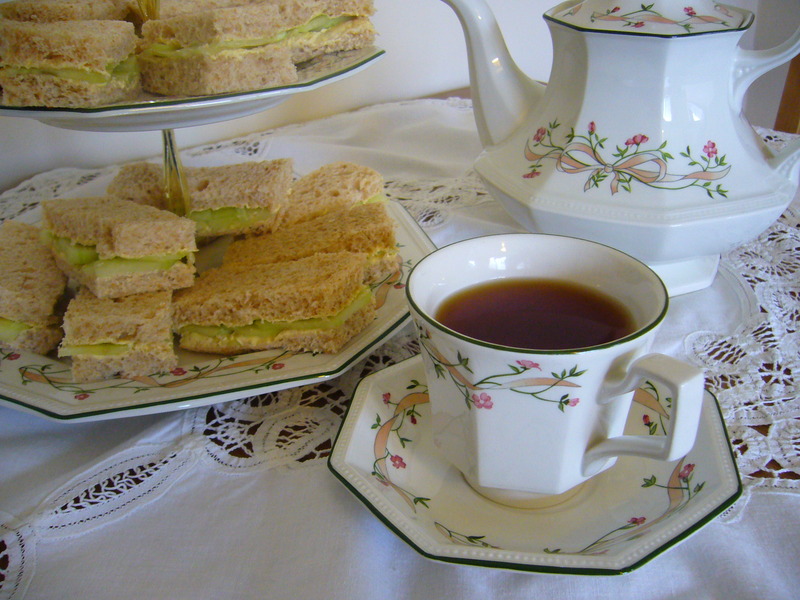 Nothing goes with afternoon tea quite like cucumber sandwiches, that old English classic. Light and refreshing, they are the perfect savoury snack in the summer. For making cucumber sandwiches you’re going to need a cucumber, some vinegar, salt, unsalted butter and brown bread. 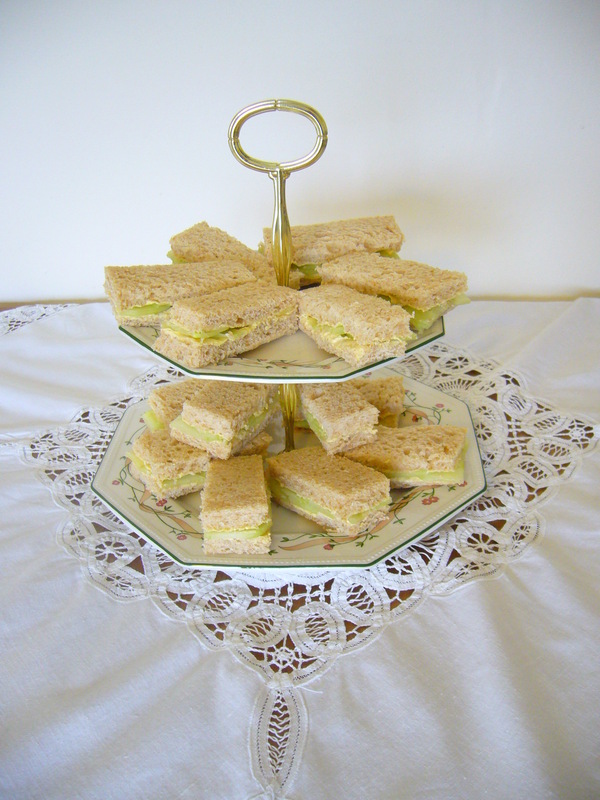 The finished product should be a selection of small and dainty sandwiches that can be served alongside afternoon tea. The first thing to do is to peel the cucumber. The best way of attempting this is to use an old-fashioned potato peeler. It’s really important remove the skin of the cucumber because nobody wants a crunchy cucumber sandwich (and this is particularly true if you have bought a waxed cucumber). 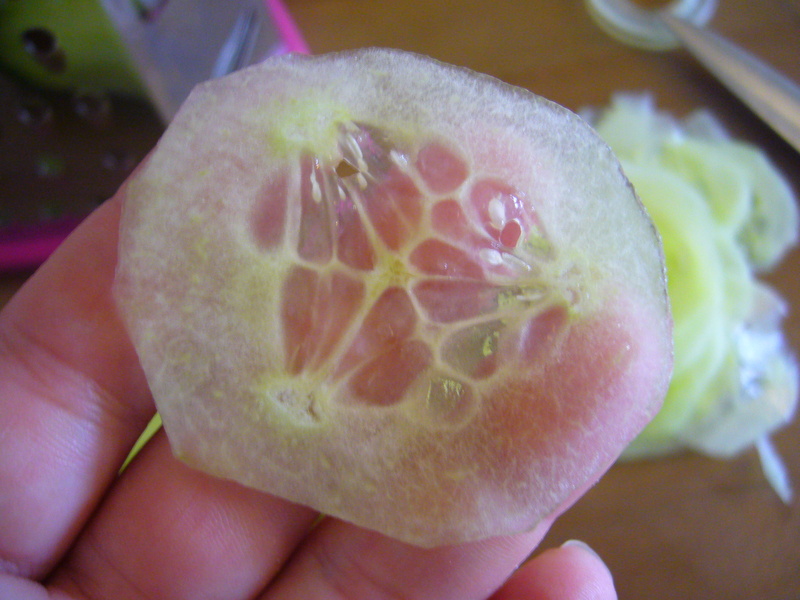 Make sure that you peel the skin away so the cucumber has no green colouration around the edges and that it has a uniformally surreal, almost white, fleshy colour all the way round. 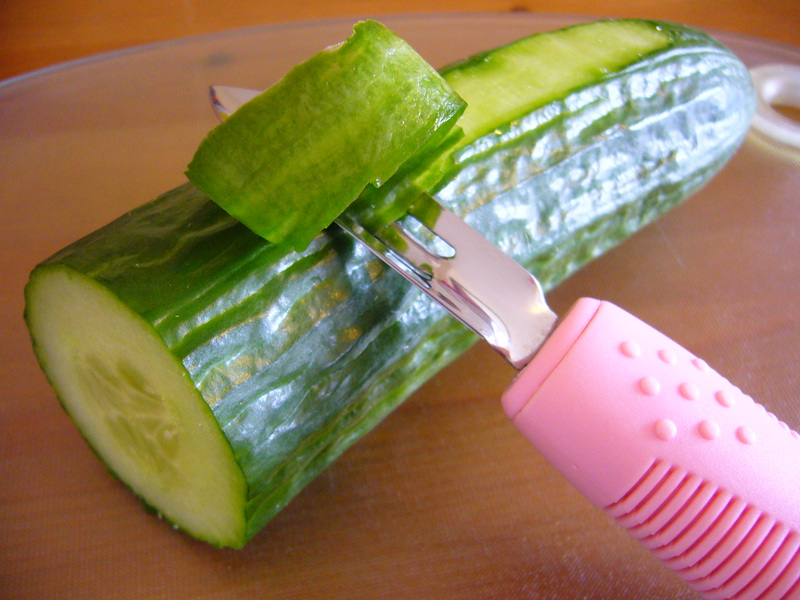 The secret to a good cucumber sandwich is in the slicing. You want to make sure that all your slices are complete circles, and that they are as thin as possible. Some people like to use the slicing edge of a conventional cheese grater to achieve thin slices-I tried this but found that all I got was partial and soggy slices, so I tried a good sharp knife and a steady hand. After a few practice goes, I found that this was a much more reliable method of getting complete and very thin slices of cucumber. The aim of the game is to achieve as thin slices as possible but without losing any fingers. Ideally, the slices should be so thin that if you hold one up you can see your fingers through it. 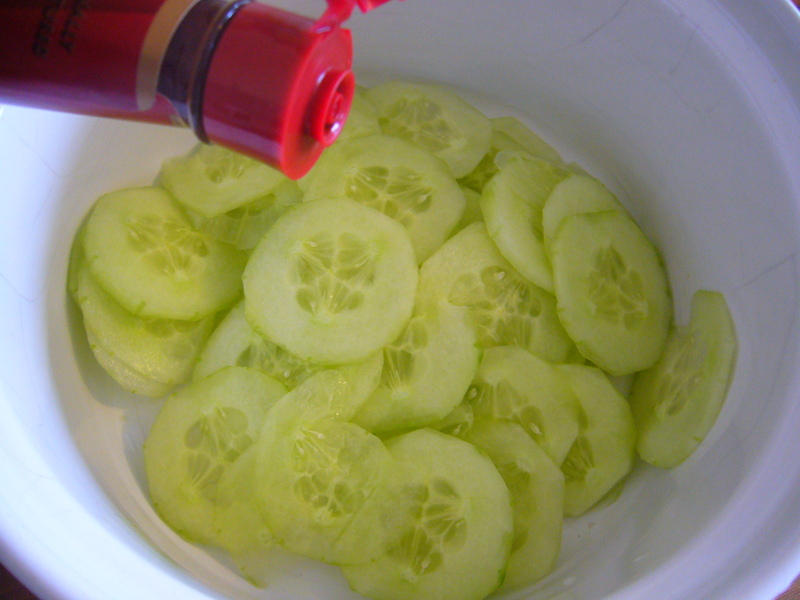 Once you’ve sliced the cucumber, put all the slices into a bowl and add a dash of vinegar. 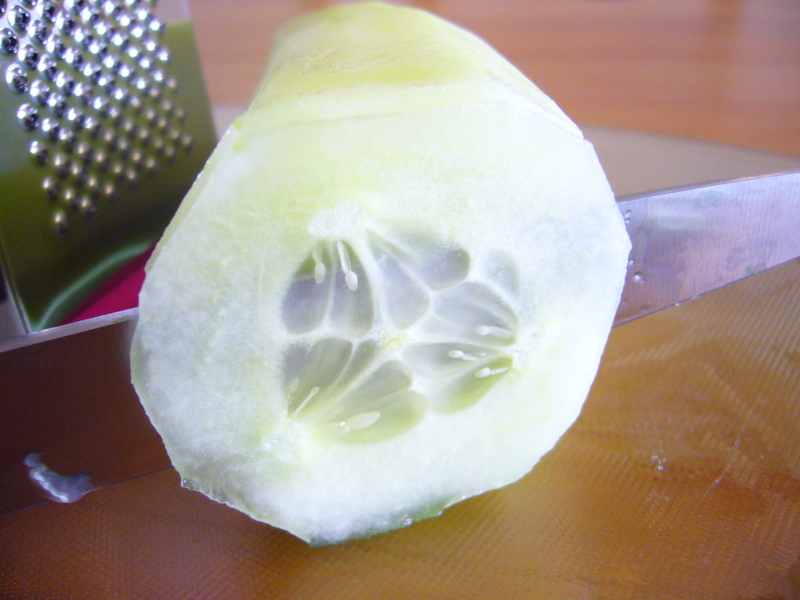 Then sprinkle a pinch of salt across the cucumber and lightly toss the slices. Then add another sprinkle of salt and leave to rest for about 45 min. This adds some flavour to the cucumber, but be careful not to add too much vinegar because that might begin the pickling process, and nobody wants to eat a pickled onion sandwich (at least not at afternoon tea!). While the cucumber slices are resting, you can prepare the slices of bread-and-butter. Brown bread compliments the flavour of the cucumber, but you should be careful not to select a loaf which is seeded or coarse. Unless you bake your own bread, you’re going to be pretty much limited by what the shop has to sell. I chose a loaf of brown bread which was very finely milled and I also picked the thinnest sliced loaf that I could find. 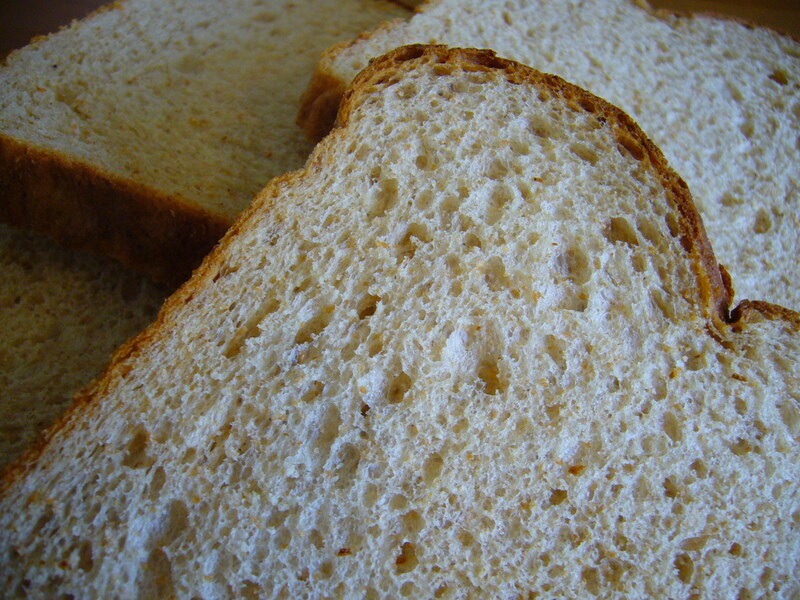 Ideally, the bread should be sliced as thin as paper. Spread the unsalted butter across the slices-it is wise to use unsalted butter here since the cucumber has been resting in salt and vinegar before it is put on the sandwich, and we don’t want our sandwiches to be too salty. Once the cucumber has finished resting in the salt and vinegar, toss it again lightly and then (gently) pour the cucumber from the bowl and into a sieve. This should ensure that any vinegar rinses off the cucumber mix and will prevent your sandwiches from being too soggy. Arrange some slices of cucumber on a slice of bread. 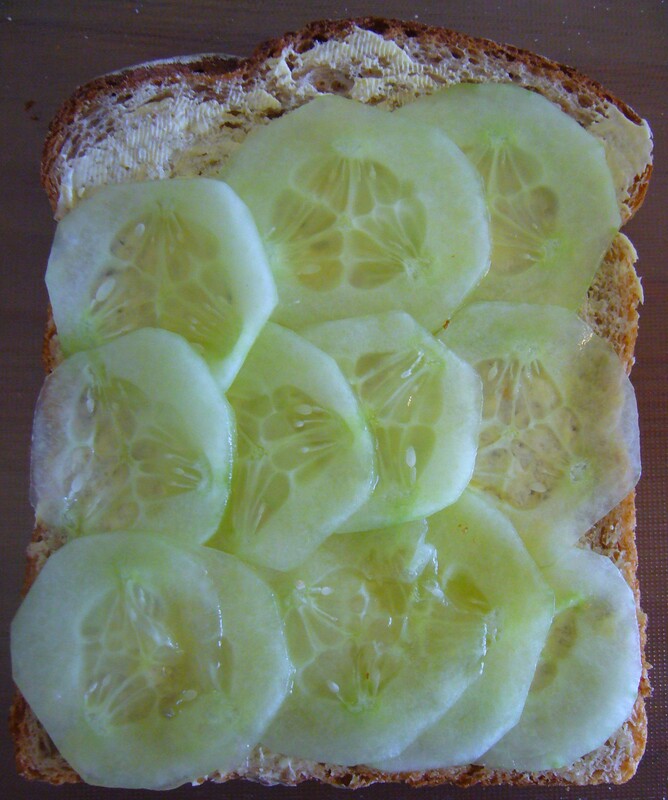 If the slices are very thin, then it’s best to have two slices of cucumber on top of each other in the sandwich. I have discovered through practice that the sandwiches are more structurally sound if you tile the slices of cucumber one over the other. Place the other slice of bread on top of the cucumber to complete the sandwich. 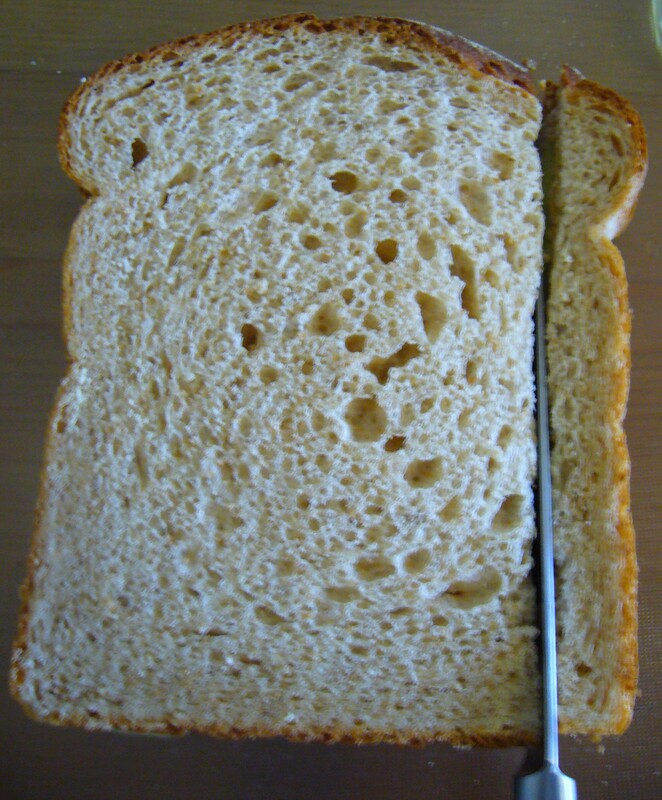 Now place your hand on top of the sandwich, firmly but without crushing the bread, and remove the crusts using a sharp knife. 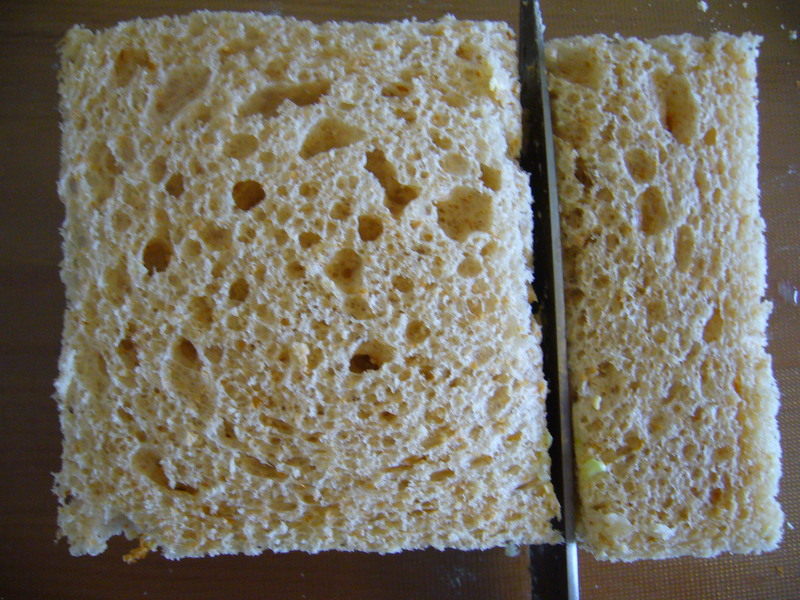 Once you have removed the crusts, the next thing to do is to slice it into finger sandwiches. 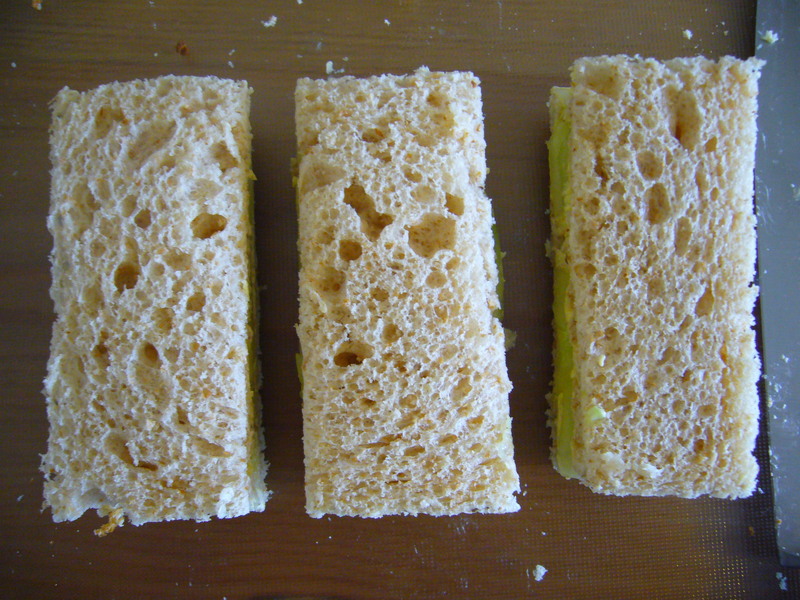 You can usually get three finger sandwiches out of one sandwich. Divide the sandwich into three as accurately as you can, but don’t worry if the finger sandwiches are not all the same size-while we do want to create small and dainty finger sandwiches for ladies at afternoon tea, some discrepancy in size is all part of the “home-made” charm. 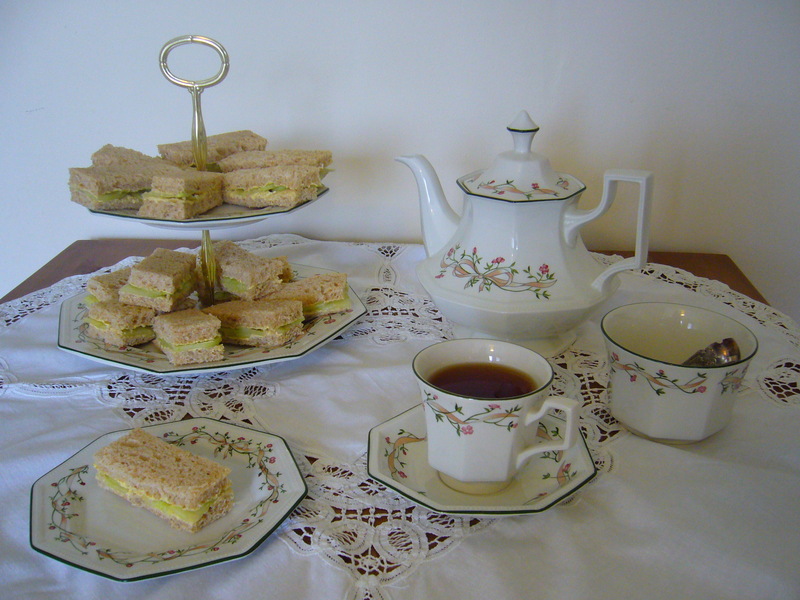 Arrange the cucumber sandwiches on an ornamental dish or a cake stand if you have one. 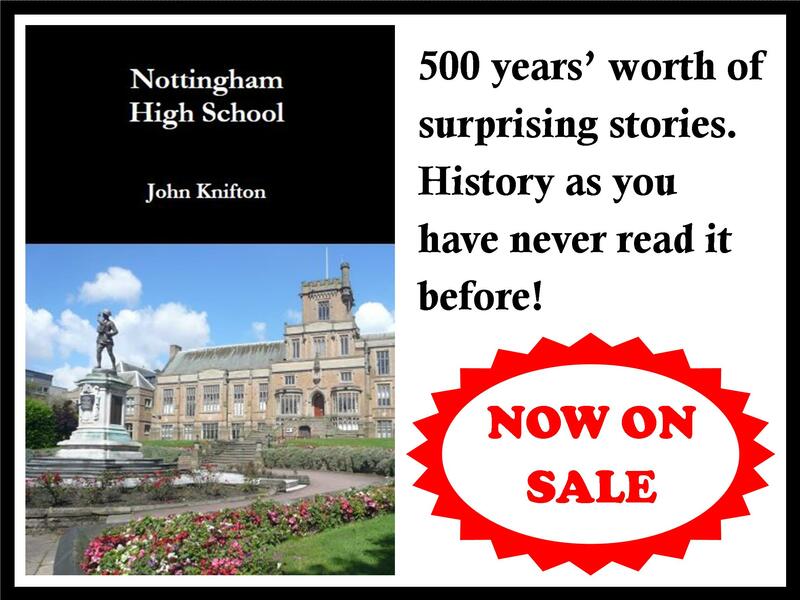 Prepare the afternoon tea and serve your cucumber sandwiches on small cake plates. Enjoy! The tea set used in these photographs is Eternal Beau by the Johnson Brothers. ‘The aim of the game is to achieve as thin slices as possible but without losing any fingers.’ The aim of EVERY game. They look delicious, arranged on the cake-stand like that! Thanks for the recipe. I have always soaked the cucumber in lime juice and used salted butter. But then it could be a variation. Thank you for the help …will be serving 100 senior woman with an assortment of cucumber ..
Chicken salad…ham salad…..egg salad . Do you think 3 each is too much?? ?